← Ahh… Is This What Morning Feels Like? As the temperatures drop drastically. The desert dwellers pull out their parkas and winter ware. I dig through photos of winters past for a fun one to share. Welcome to Las Vegas in the winter. Just minutes outside of the city you’ll find Mount Charleston covered in powder. Last year, you would have found Mr. Snowman Rupp. Daddy Rupp, Mama Rupp, and the little Rupps built him on our first trip up in November and each time we visited the rest of the season we saw that he was the photo op stop for all other family visiting the area. Glad the Rupps could add to the flurious fun for everyone! 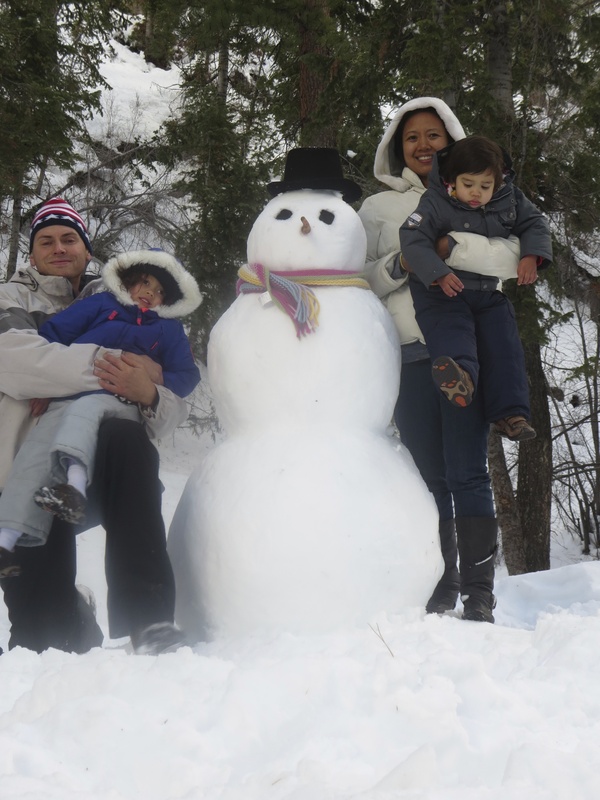 Posted on November 19, 2014 by MamaRupp	• This entry was posted in Uncategorized and tagged cold, family, fun, snowman, winter. Bookmark the permalink. Thanks. It was mostly the hubby that did the work. Marley helped a little, and Jackson was scared to touch the snow that first time up so I help him almost the entire time we built the snowman.